Broida on Federal Sector Mediation - Dewey Publications Inc. Presented by Peter Broida, this video training course provides comprehensive instruction on federal sector mediation. 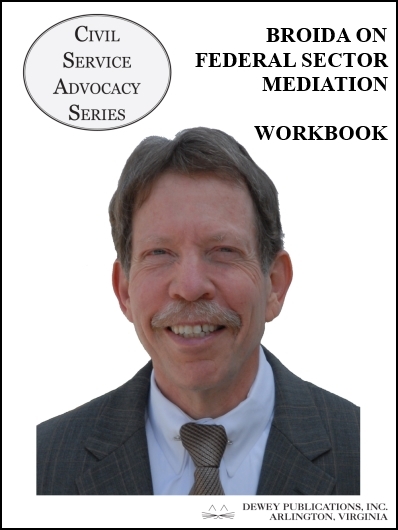 The course includes Mr. Broida’s lecture (.mp4 video file sent on a CD-ROM); a workbook with course notes—outline and a listing of related products; and a copy of The Advocate's Practical Guide to Using Mediation by mediator John Settle. Additional workbooks sell for $25 each or in sets of 10 for $150. Call or email to purchase.